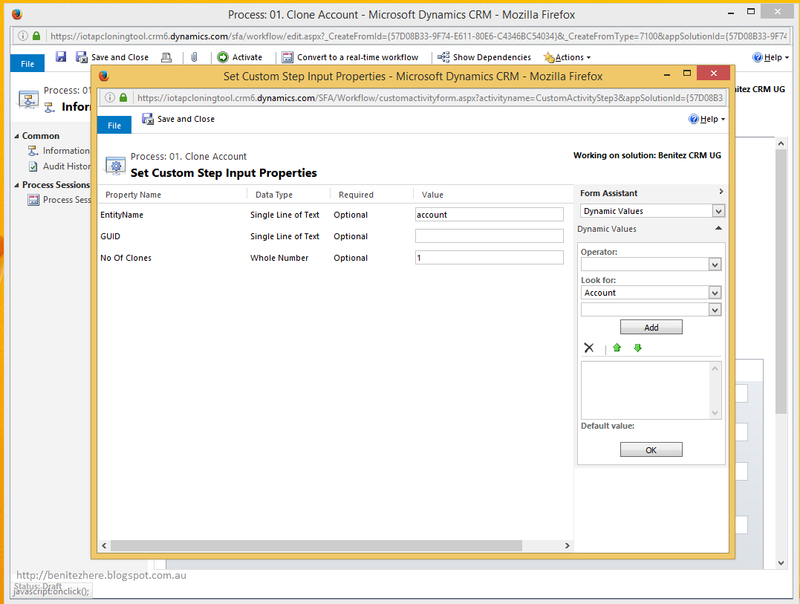 Cloning is one of those nifty features that doesn't exist in Microsoft Dynamics CRM out-of-the-box. The exception is in the Product Catalog where you can clone a Product but alas, elsewhere in CRM it does not exist. 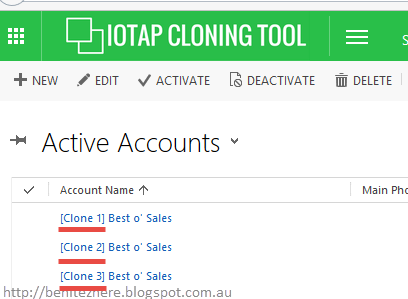 Enter IOTAP Record Cloning - with one click you can clone a single record or generate multiple cloned records. 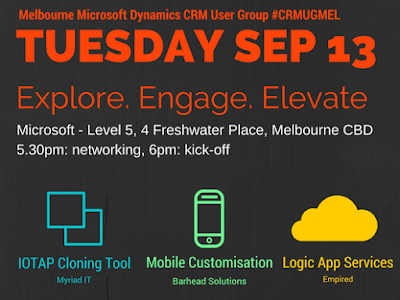 I presented the IOTAP Cloning Tool earlier this week at the Melbourne Microsoft Dynamics CRM User Group so thought I'd share it with you CRM'ers as a vlog. Check out my vlog below (and same as last time, blooper reel at the end). 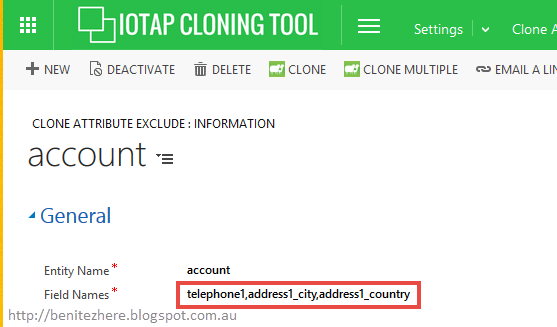 What is the IOTAP Record Cloning? 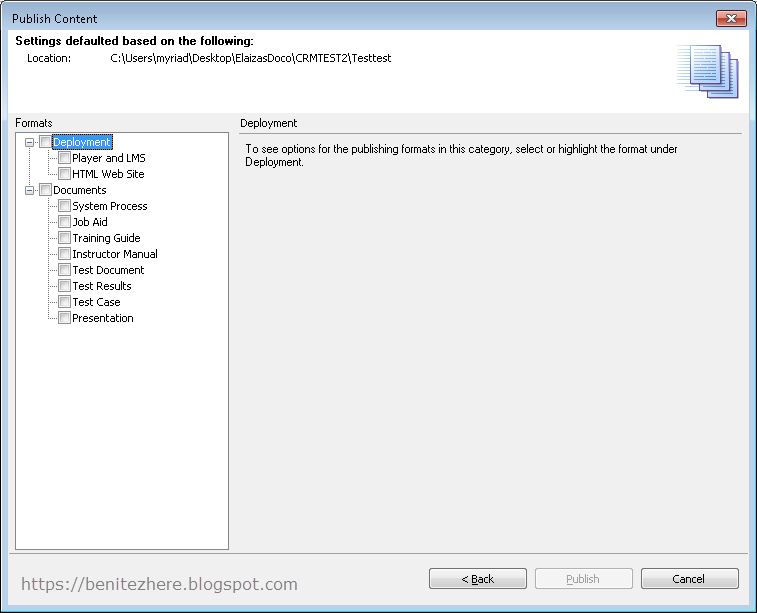 Once installed you can clone and do some additional configuration to modify the cloning output. The cloning tool allows you to clone records at a primary level such as clone an Account. 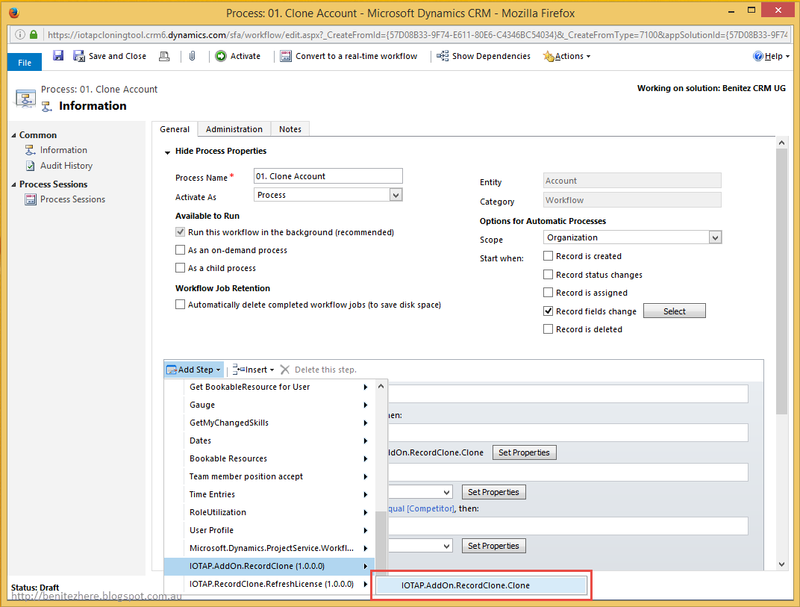 It also allows you to clone related records such as clone the Contacts associated to the Account when cloning an Account record. 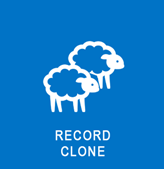 You have the option to clone a single record or generate multiple cloned records from a record. 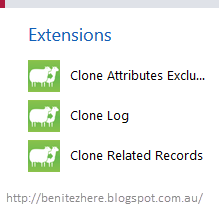 When the cloned record is generated, you'll see a prefix of [Clone] appended to the name of the record. 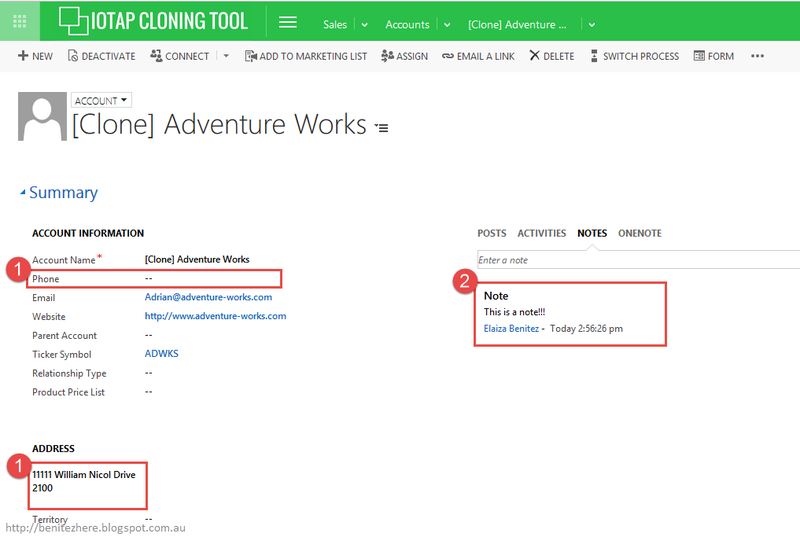 You can also generate cloned records from a CRM workflow. The IOTAP Record Cloning tool managed solution provides a custom workflow activity which you can call as a step in a CRM workflow. What configuration do you need to do? For #1 and #2, navigate to this area by heading to Settings > Extensions. If you want to exclude fields when cloning records, you can do so by referencing the Name of the field. To add more fields, simply insert a comma and the Name of the next field you want to exclude. Grab the Name of the field through the CRM solution. If you want to clone related records, you can do so by referencing the Name of the parent entity and the relationship Schema Name. 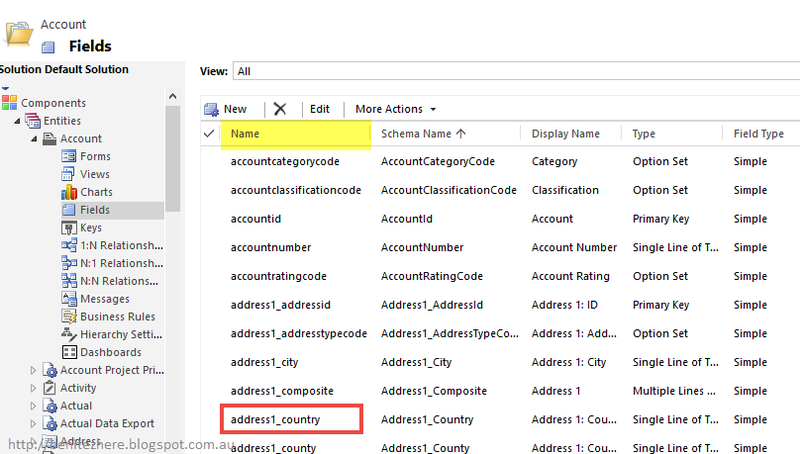 Grab the Schema Name of the field through the CRM solution. The IOTAP Record Cloning tool managed solution includes a custom workflow activity. Create a new workflow and simply add the custom workflow activity as a step after your condition. Define the properties in the workflow by entering the entity name and the number of cloned records you would like to generate. More about what the GUID is used for here. When the condition has been met, the custom workflow activity will kick in and you'll see the cloned record in the entity view shortly. In my vlog, I had a simple condition where, when the Account Relationship Type equals "Competitor," go ahead and clone the Account. 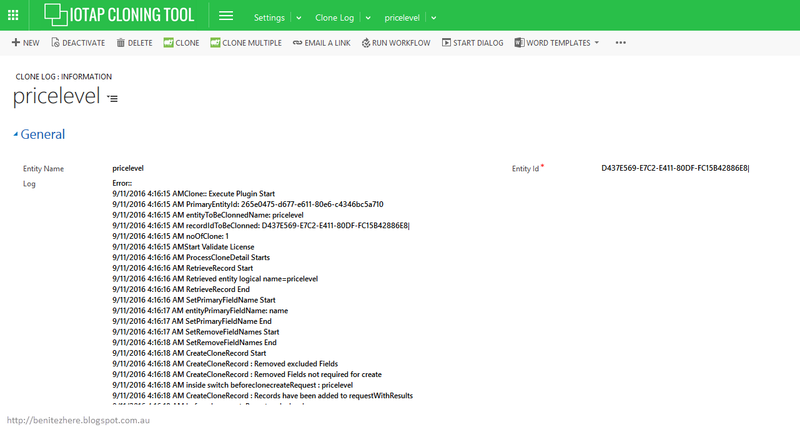 There's also a Clone Log which is useful if you need to understand why a clone process failed. You can also provide the details to IOTAP support should you need additional assistance. When cloning related records, it does not cascade to additional related records. When cloning an Inactive record, it will generate the cloned record in an Active State. For example, if you clone an Opportunity that has been closed as "Won," it will be Active with the last Business Process Flow of "Close" as the stage. You can only clone 1:N, N:N related records. N:1 (lookup records) will not be cloned. An example is the the Customer field on the Order, only Order Products would be cloned. Here's how much it costs. It's not that expensive in my opinion as it provides functionality that does not exist in CRM out-of-the-box. Is there another method of cloning I can use? If you don't need to clone related records and only want to clone a record at a single level such as Accounts and no associated records (eg. Contacts associated to the Account), refer to Leon's blog post. You can create a workflow that will clone a CRM record. This is great as there's no licence or developer involved however the cost is time as you will need to configure the workflow yourself. Not really a big issue. 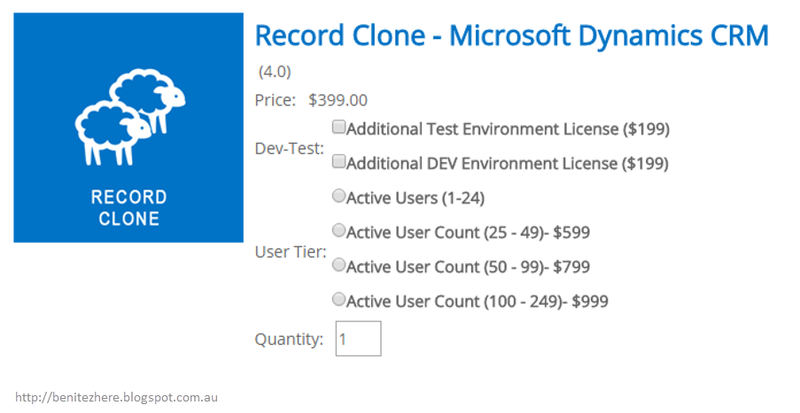 Do you need to clone across CRM and related records? Then use the IOTAP Record Cloning tool. Do you only need to clone records for set records at a single level and not related records? Try out Leon's suggestion. If it doesn't suit you, it's cool - try the IOTAP Record Cloning ool. The trial lasts for 10 days. Do I recommend it? Of course! Try it out for yourself. 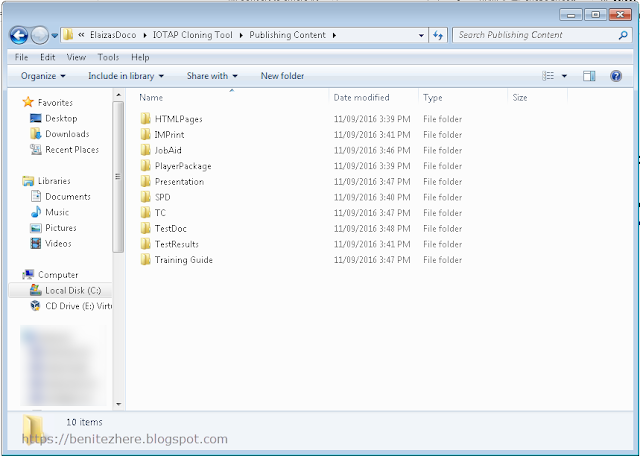 In my vlog I simply installed a trial of the IOTAP Record Cloning tool in a trial Microsoft Dynamics CRM Online environment. This new clone would be out in early November. It's not everyday that you come across a post that combines an Oracle product with a Microsoft product. Today, you will experience just that. In this vlog I cover Oracle's UPK with Microsoft Dynamics CRM Online, where I demonstrate how to clone a price list using IOTAP Cloning Tool. I'm sharing my awe of Oracle UPK as it's a great tool to produce learning material that can help with training and end user adoption. It's a fantastic tool to capture knowledge and maintain all documentation in one place. In my last vlog I outlined the importance of Entity Relationship Diagrams when it comes to the solution design of a project. This time round, I'm referring to the end user learning and testing of the project which ultimately leads to end user adoption. The result of the system built will be determined by how well end users embrace the system day in and day out. End users can't embrace a system if they don't know what they can do with it. Learning, training and testing of the system facilitates this gap where the desired output is acquired knowledge from interacting with the new system. every person has a different learning curve, some are adaptable to new systems whereas others are not. The end user acceptance of a new system can vary as a result. It's critical for end users to be able to learn and know how to use a new system otherwise the time and budget spent on a new system will not be beneficial to the organisation. Yes, designing it right is also important but it goes hand-in-hand with how the end users interact with the new system. that's what it is to me but all good, we'll stick with User Productivity Kit. Oracle UPK can help support the learning and knowledge process. It's a tool that allows you to record an end user process and generate outputs that can be used by the end users of the system. You have the ability to update the recording at any point in time to re-generate outputs which is awesome in the scenario where outdated documentation needs to be updated such as a training guide. There's two parts to UPK, Developer and Knowledge Centre. 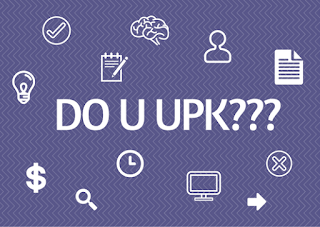 UPK developer allows you to build and create content whereas UPK Knowledge Centre is what the end users have access to using the files produced. I demonstrated UPK developer in my vlog. The shell of UPK is: Library > Modules > Sections > Topics. 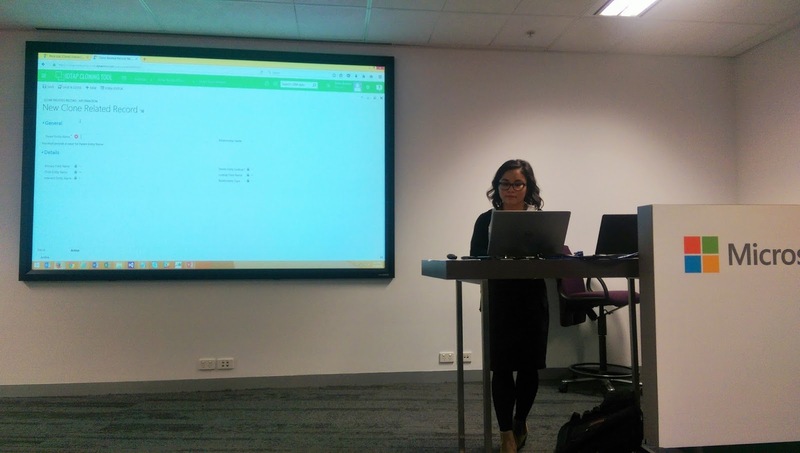 Within a Topic, you can record an end user process using the browser. Oracle UPK works with browsers so as long as you are using a software that is accessible by browser, you'll be sweet. 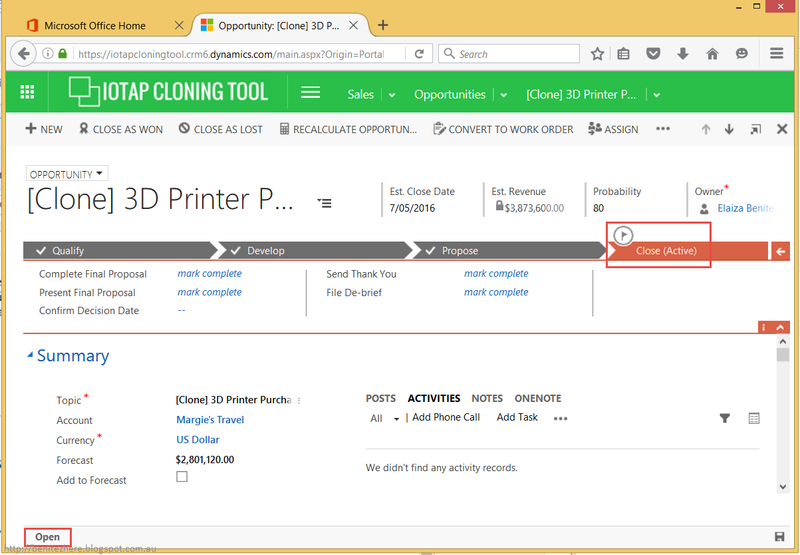 I used Microsoft Dynamics CRM Online to record an end user process of cloning a price list using IOTAP Cloning Tool. You simply hit the record button and a recording window pops up that will record your browser interaction. The Print Screen key will start the recording and will also stop the recording. When you start recording, all clicks will be captured as "frames." Remember, every click will be captured so make sure you do a test run first. Don't worry, you can always delete your frame when you edit the content. I didn't show how you can delete frames you don't want. All you need to do is select the frame in the bottom of the editor in UPK developer and right click to "cut" a frame out. Easy as, bro. Once you're happy with your editing, you can publish your recorded end user process and content. The following is a screenshot of the type of outputs generated. The documents generated are pretty impressive. 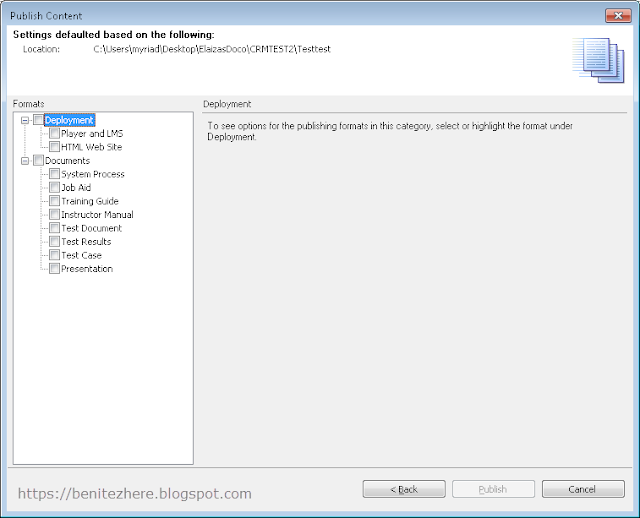 The remaining documentation is in the format of Word documents. I didn't do any configuration and it generated the recorded end user process as-is in each of the documents. Sooooooo cool. I don't know whether your reaction is the same as mine but as someone who has spent hours in the past carving up documentation for a Microsoft Dynamics CRM solution, seeing Oracle UPK in action was a game changer for me. You record, edit and produce learning material in half the time. every person has a different learning curve, some are adaptable to new systems whereas others are not. The Player and LMS output of UPK allows end users to learn at their own preference and pace. 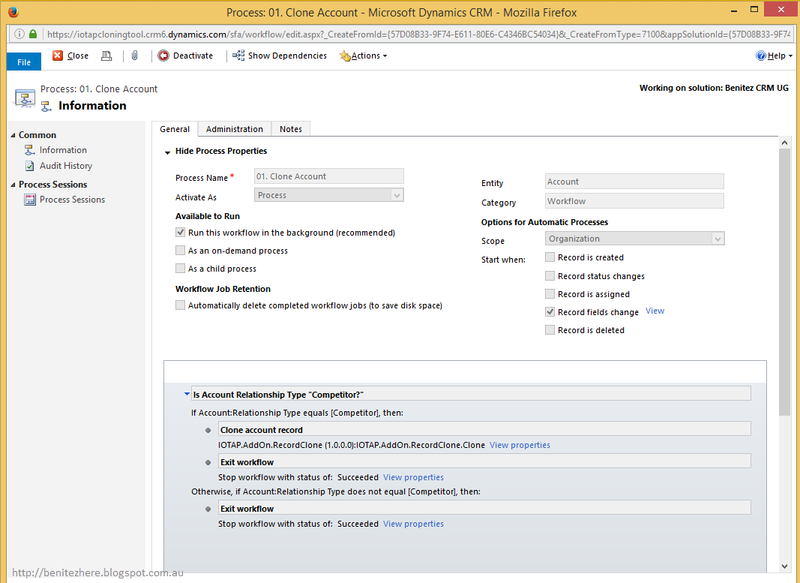 Microsoft Dynamics CRM Online can be embraced by end users if there is supporting material in place. As communicated in the two articles I provided earlier, it's really important for end users to learn and foster their knowledge of a new system. Allow Oracle UPK to help and you'll get there. If you're interested in using Oracle UPK for your next CRM implementation, please get in touch with Myriad IT. Thanks for reading and til next time, toodles. Come to the next Melbourne CRM User Group on Tuesday September 13. I'm presenting the IOTAP Cloning Tool which is what I showed in the UPK Developer recording in my vlog. I showed how to clone a Price List where the Price List Items are also cloned.